are nothing short of amazing." Grew up on the Monkees, thinking they were a real group. Played rock guitar throughout High School -- crudely, and too loud. Sang in Madrigals and Barbershop Quartet ("blends well", said teacher). Later studied classical guitar ("doesn't practice"), then jazz guitar ("unable to play fast"). Fooled around with lutes, mandolins, and whatnot, against teacher's recommendations. Began acquiring stringed instruments of every size and description. Composed and recorded original instrumental music long before it became fashionable. Took up the pedal harp and freelanced for awhile, including stint as L.A.'s first street harpist. Played guitar in comedy Oldies band, The Pretensions -- until the members became too pathetically old themselves. 1991 - 1995: Completed life's work of playing every instrument in the collection (~100 at the time). 1996-2000: Promoting "A Christmas Collection." Figuring out how to play some of these instruments live. Becoming enough of a computer nerd to maintain this web site. 2000-? : Working on next "secret project." Packaged some of my original tunes for my patient fans. 2002-indefinite: Created a whole new web site devoted to the harp guitars and other instruments of turn-of-the-century builder Chris Knutsen. 2004-indefinite: Created Harpguitars.net, the largest, most complete Internet resource on a single musical topic that I am aware of. 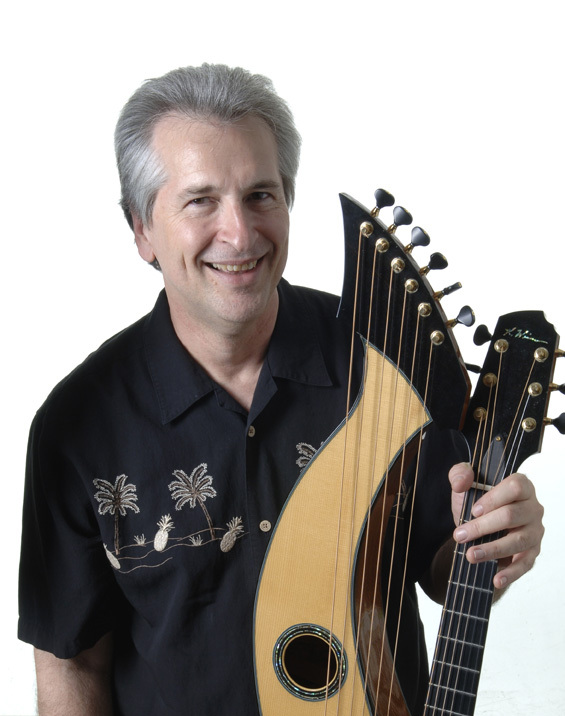 2006: Opened Harp Guitar Music, record label and the world's first all-harp guitar web store. 2009: With several cohorts, created The Harp Guitar Foundation, of which I am currently president. We guide and fund the annual Harp Guitar Gatherings and HG.net....me, I never sleep. I'm basically your typical part-time musician, though with unusually diverse musical experience, and a rather passionate interest in stringed instruments of every description. I originally labeled myself a collector, recording artist, and "armchair musicologist" -- meaning that, without leaving my house much, I managed to appear to be a "world-renowned expert" on the entire realm of stringed instruments. Since my "humorous essays" written about the instruments for my Christmas Collection booklets, I've had to present my subsequent, not-insubstantial research a bit more seriously. And I am quite the geek. I still divide my time between the arts (music career) and sciences (aerospace workaday world), and in the past have worked as a free-lance harpist, zookeeper, animation art dealer, and rock & roll comedian.